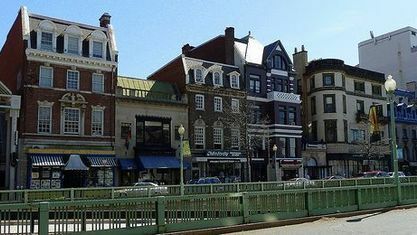 Dupont Circle is a thriving neighborhood, park, and historic district in Northwest Washington, D.C with a traffic circle is located at the center. The neighborhood is tree-lined with rowhouses, retail, restaurants, small shops, office buildings, embassies, institutions, and a large commercial strip on both sides of the circle. The Dupont Circle neighborhood is bounded approximately by 16th Street NW to the east, 22nd Street NW to the west, M Street NW to the south, and Florida Avenue NW to the north. The local government Advisory Neighborhood Commission (ANC 2B) and the Dupont Circle Historic District have slightly different boundaries. After the Civil War, Dupont made its rise from a rural backwater to a fashionable new residential district after a massive modernization program which built streets an sewers during the 1870s. In 1871, the circle itself (then known as Pacific Circle) was constructed, and in 1882 Congress decided to use the circle to honor Civil War admiral Samuel Francis Du Pont. By the 1870s and 1880s, impressive mansions were built along Massachusetts Avenue, and Connecticut Avenue had more shops and offices. Much of the area was developed with rowhouses, many of which remain today. 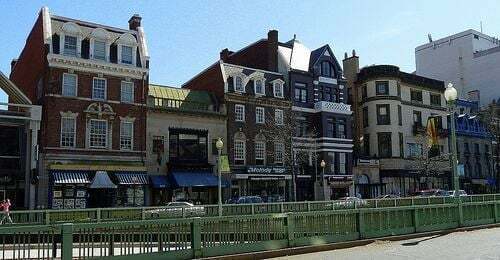 The 1980s and 1990s saw more reinvestment in the neighborhood, and today Dupont Circle is again one of DC’s most desired neighborhoods. Get to know Dupont Circle better with our featured images and videos.